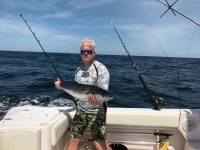 Carolina Kingfish Classic Compliments ! Carolina Classic 30 days away ! 1 of Our Biggest Sponsors of all! Charter out of Jacksonville or Topsail area? Rumble in the Jungle Results? Kings are on the Beach !